A great companion for practicing guitar, bass, acoustic guitar, winds, or any type of instrument! The Korg KR mini - an easy, simple and compact rhythm machine with a built-in speaker and optional battery power for play-anywhere convenience! Many musicians wish that they could enjoy casually performing while being backed up by real rhythm patterns rather than just a metronome. 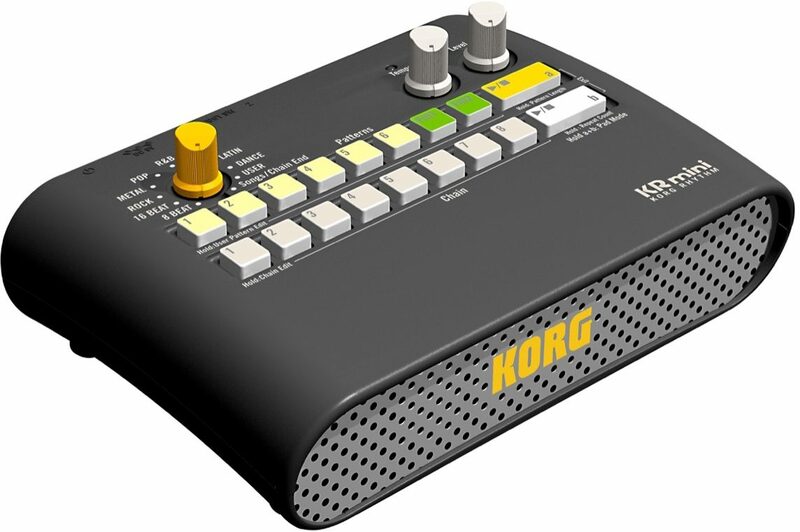 Korg has responded to these wishes with the KR Mini rhythm machine. It features a simple design that eliminates all complex functions, looks that overflow with nostalgia and analog-like controls. Playing a rhythm pattern is easy as making selection and pressing play. A total of 60 diverse rhythm patterns and 120 fills are ready to accompany you. Easy, simple and compact, the KR mini can play its role anywhere. Just use the knob to select the musical style you want and press a button to start playing a rhythm! 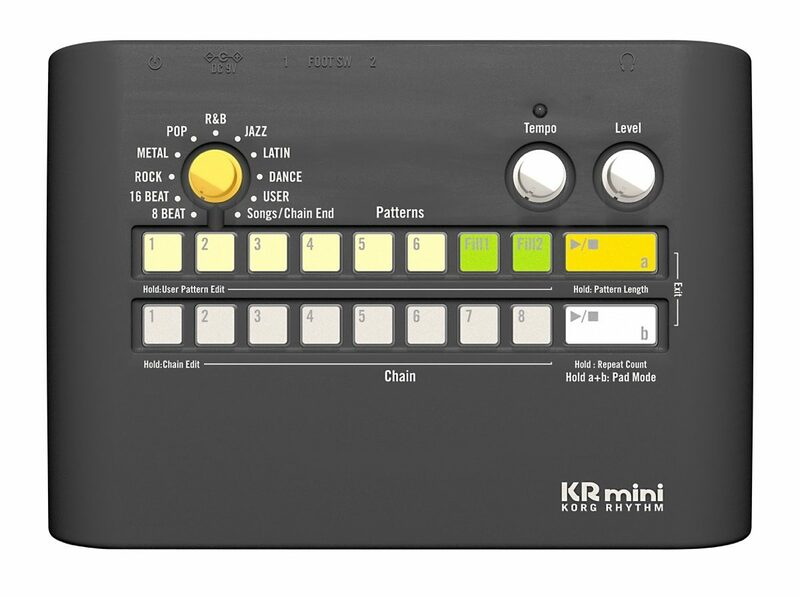 Since the KR mini is light-weight, can operate on batteries and has a built-in speaker, you can use it to provide a backing rhythm pattern wherever you are. It covers a wide range of genres, including 8-beat, 16-beat, rock and pop, with six patterns for each genre. Plus there are eight song patterns containing drum parts that are several measures in length. It's a must-have item that will be perfect not only for guitarists and bassists but also for wind/orchestra players and pianists. Connect rhythm patterns to create original rhythm songs! There's a Chain function that lets you easily create original rhythm songs by connecting preset rhythm patterns. It's also easy to create more complex rhythm songs; you can include fill-ins and specify the loop end location as well as the number of playback repetitions. Use the pads to play the drums! Ideal for finger drumming! The 16 pads are assigned to play drum sounds such as bass drum, hi-hat and cymbals. You can use these pads to enjoy finger drumming. The pads are velocity sensitive, so the force used to strike a pad will be reflected by the sound; letting you create even more realistic drum phrases. Although finger drumming has typically been done using a PC-based system with samplers and MIDI controllers, the compact KR mini, with its built-in speaker and battery-powered operation means that now you can enjoy performing on the street, outdoors, or anywhere you may be inspired. The KR mini is a necessity for any finger drummer. "My new best friend "
Overall: I have a new best friend for 2017 and it's name is Korg mini rhythm machine. I i'm having alot of fun . Style of Music: Old school funk,blue's.R&B,etc. 8 of 10 people (80%) found this review helpful. Did you? Overall: I am still somewhat of a rookie in learning the Guitar and 99.9% of my practice time I am by myself. I do Not keep time well in my head and do not like standard type metronomes. This is a simple but effective lil rhythm machine that is fun to play along to ( at least for a newbie like me ) and is most def improving my timing and tempo. Look forward to trying to make customized rhythm patterns. Nice being able to connect it to a spare fender mustang ( aux-in) amp for full sound. ( it required me to rate Manufacturer Support but I've not needed any ). I am sure there a much nicer (and more expensive) models out there but this is a simple model that met this rookies needs. 10 of 13 people (76.92%) found this review helpful. Did you?